ENGELBERT HUMPERDINCK. THE LAST WALTZ. RECORD IS IN VG CONDITION AS PER GRADING SYSTEM. WE ALWAYS GRADE OUR RECORDS AS PER GUIDE. The record has been played so much that the sound quality has noticeably deteriorated. 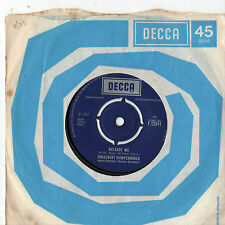 1967 UK 7" vinyl single with intact four prong centre. This is one of 10000 singles LP's, 12” and 7" that I HAVE COLLECTED OVER THE LAST 30 YEARS; they run from the 1950's to the 2000's and cover every style of music. ARTIST: Englebert Humperdinck. TITLE(S): The last waltz, That promise. CATALOGUE No. : f 12655. DISC condition: vg . B. side; That Promise. On the original Decca label, F12655, in excellent - condition. Weight 44g. 7" SINGLE 1967, DECCA F12541. GOOD CONDITION. ENGELBERT HUMPERDINCK - OUR LOVE WILL RISE AGAIN. 7" SINGLE 1971. 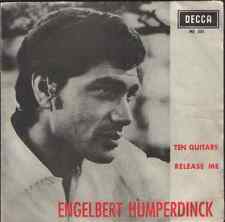 ENGELBERT HUMPERDINCK - A Man Without Love - 1968 UK 7"
ENGELBERT HUMPERDINCK - A Man Without Love. 1968 UK 'boxed' Decca logo blue & silver label 7" vinyl single. Country of Origin: UK. ENGELBERT HUMPERDINCK - THERE GOES MY EVERYTHING. 7" SINGLE 1967, DECCA F12610. VERY GOOD CONDITION. ARTIST: ENGELBERT HUMPERDINCK. A SIDE: I'M A BETTER MAN. CONDITION: VG . Minor surface mark(s). Plain white sleeve. SLEEVE CONDITION. ARTIST: ENGELBERT HUMPERDINCK. "Sweetheart" written by Barry & Maurice Gibb. Side 1: Sweetheart. RECORD CONDITION New white paper sleeve. SLEEVE CONDITION Side 2: Born To Be Wanted. Side 1: DR-47798-T1-1C. 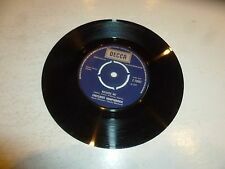 ENGELBERT HUMPERDINCK The Last Waltz - 1967 UK 7" vinyl single, also including That Promise, F12655. Record Condition : Excellent. POOR: The record will not play properly due to scratches, bad surface noise, etc. Light shelf/ ring wear. Vinyl in near perfect condition. Format: Vinyl, 7", 45 RPM, Repress. Records advertised as Sealed or Unplayed should be Mint. ENGELBERT HUMPERDINK - Best of Engelbert Humperdinck. 1970 UK 7" vinyl single. This is one of 10000 singles LP's, 12” and 7" that I HAVE COLLECTED OVER THE LAST 30 YEARS; they run from the 1950's to the 2000's and cover every style of music. 7" SINGLE 1968 DECCA F12722. VERY GOOD CONDITION. LES BICYCLETTES DE BELSIZE / THREE LITTLE WORDS. ENGELBERT HUMPERDINCK. DECCA Y-8524. Label & Cat No: Decca 79024. Artist: Engelbert Humperdinck. Year: 1968. Title: A Man Without Love. We try to provide the best image possible and we don't trim the photographs so you can clearly see the sleeve edges. The last waltz/Am I that easy to forget. Artist: Engelbert Humperdinck. Catalogue Number: F.12541. the sound, which is why we play testall of our records. So you know the sound quality of the record you're getting, not just what it looks like. Artist: Engelbert Humperdinck. A: Our Love Will Rise Again. the sound, which is why we play testall of our records. So you know the sound quality of the record you're getting, not just what it looks like. Hi There : This is ENGELBERT HUMPERDINCK - THE LAST WALTZ 7" single. The vinyl looks very clean and has a nice shine to it. ( only very light wear ). wear from General handling and Storage. ENGELBERT HUMPERDINCK - Am I That Easy To Forget. 1968 UK 7" vinyl single. Country : UK. With intact four prong centre. This is one of 10000 singles LP's, 12” and 7" that I HAVE COLLECTED OVER THE LAST 30 YEARS; they run from the 1950's to the 2000's and cover every style of music. ENGELBERT HUMPERDINCK - Take My Heart. Featuring Winter World Of Love with intact original four prong push out centre. 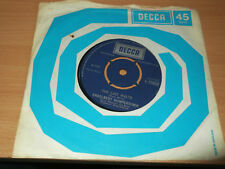 1967 UK 'boxed' Decca logo blue & silver label 7" vinyl single. ENGELBERT HUMPERDINCK - There Goes My Everything. 1967 UK 7" vinyl single. Country : UK. With intact four prong centre. ENGELBERT HUMPERDINCK - The Last Waltz. 1967 UK vinyl 7" single. This is one of 10000 singles LP's, 12” and 7" that I HAVE COLLECTED OVER THE LAST 30 YEARS; they run from the 1950's to the 2000's and cover every style of music. Artist: Engelbert Humperdinck. The cover and contents suffer from folding, scuffing of edges, spine splits, discolouration etc. Catalogue Number: f12879. the sound, which is why we play testall of our records. 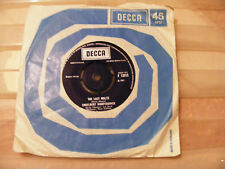 New listingEngelbert Humperdinck 'The Way It Used To Be' Decca 7" Single EX! POOR: The record will not play properly due to scratches, bad surface noise, etc. Records advertised as Sealed or Unplayed should be Mint. FAIR: The record is still just playable but has not been cared for properly and displays considerable surface noise; it may even jump. (1) The Last Waltz/That Promise (Decca F12655) UK 7" single 1967 ex. Beyond this an "Unpaid Item Dispute" may be opened. Vinyl is in very good condition, May need a clean. ARTIST: Englebert Humperdinck. CATALOGUE No. : f 12770. DISC condition: ex-. Decca f12541. Here is one of hundreds of original Demonstration singles that belonged to the BBC. Nice VG Condition. ENGELBERT HUMPERDINCK - Take My Heart. 1967 UK 'boxed' Decca logo blue & silver label 7" vinyl single. Country of Origin: UK. Artist: Engelbert Humperdinck & Gloria Gaynor. Catalogue Number: PB41617. the sound, which is why we play testall of our records. So you know the sound quality of the record you're getting, not just what it looks like. Artist: Engelbert Humperdinck. Catalogue Number: F13281. the sound, which is why we play testall of our records. So you know the sound quality of the record you're getting, not just what it looks like. ENGLEBERT HUMPERDINCK. The Last Waltz. Artist: Engelbert Humperdinck. A: The Last Waltz. Catalogue Number: OG9351. the sound, which is why we play testall of our records. So you know the sound quality of the record you're getting, not just what it looks like. Artist: Engelbert Humperdinck. Side A: After The Lovin'. the sound, which is why we play testall of our records. So you know the sound quality of the record you're getting, not just what it looks like. A: Les Bicyclettes De Belsize. Artist: Engelbert Humperdinck. Catalogue Number: F.12834. the sound, which is why we play testall of our records. So you know the sound quality of the record you're getting, not just what it looks like. Artist: Engelbert Humperdinck. A: Sweetheart. Catalogue Number: F13068. the sound, which is why we play testall of our records. So you know the sound quality of the record you're getting, not just what it looks like. Artist: Engelbert Humperdinck. A: Precious Love. Catalogue Number: F13572. the sound, which is why we play testall of our records. So you know the sound quality of the record you're getting, not just what it looks like. Artist: Engelbert Humperdinck. Catalogue Number: F12541. the sound, which is why we play testall of our records. So you know the sound quality of the record you're getting, not just what it looks like.